Committed to helping others fulfill their calling and find their purpose in life. Before I begin…I do know this post is not the normal post for me on this site but, today, I am making an exception. I hope you will pardon the change for today…. It was supposed to be a normal Sunday. A day where I would go to church and then come home and update the blog, develop my webinar content and write some more of my 3rd book. I had big plans of sitting at my computer most of the day getting caught up. After all, the laundry was done, the groceries had been purchased and all the errands were complete. All of that changed when my husband opened the back door to go to his truck. I was still getting ready for church. I hadn’t fully decided on my outfit-though I was dressed-hadn’t done my makeup and hadn’t even brushed my hair when I heard him say, “Oh, Melisssaaaaaa.” The tone of voice was one I had heard before. It meant no good. I came down and he opened the back door to display a passel of stray puppies clearly hungry. So, I hiked up my skirt and ran back inside to find whatever I could to fill with water while he took off. They drank like they had never drunk before. I went back in 3 times for more water. Their tails were wagging and they were full of kisses. And then, all of a sudden, I froze. A big ferocious looking dog comes bounding around the corner with determination. I wasn’t sure if I or the puppies were dead meat but I was pretty sure this was the end. She did NOT look friendly. My mind scattered hundreds of ways. My eyes darted looking for ideas of where I could scurry. I cried out in my heart wishing David had not left but so glad the kids and our dog were safe inside. That lasted for less than 30 seconds..
That big dog quickly wagged her tail, kissing the pups and drinking the water with them. Momma bear was so thirsty and so glad to find her pups that I became an instant friend. I breathed a sigh of relief. “Whew. Well hello momma.” I said as I petted her back and accepted her kisses. I quickly placed the call for the Constable as all the puppies began to find some semblance of peace. They were all cuddled up against our garage door resting. Momma took a bit longer to calm down but was resting by the time the Constable showed. He asked if I knew who they belonged to or had ever seen them around. He then asked if I was going to care for them until a shelter could be found. I informed him our dog wasn’t going to have any other dogs in her yard and we could not keep them. He said we would be lucky if anyone could come out on a Sunday but be would make some calls. A few minutes later he informed me they would be here by noon to pick them up and to feed them so they stayes out until animal control could pick them up. 6 bowls later, they were full and happy. I figured we could make it to noon. I posted lost animal notices on all the social media sites in case their owner was missing them. 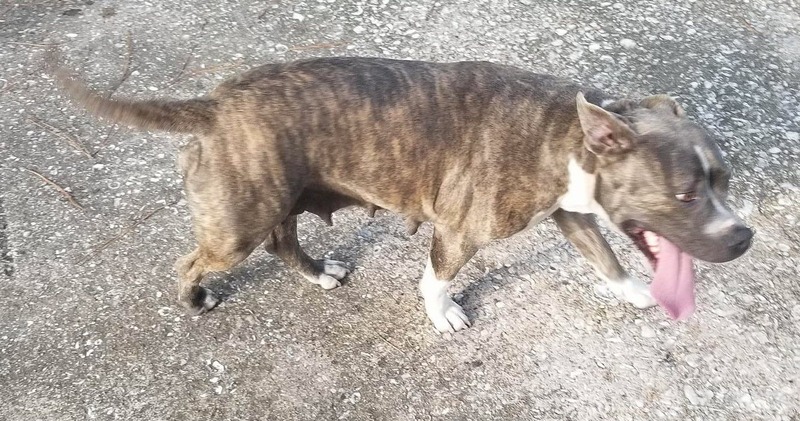 I scoured the posts of lost pets to see if anyone was missing a family of pups. No luck. Noon came and went but no animal control came by. I called the dispatch for the constable but they laughed and said no one would pick them up on Sunday. 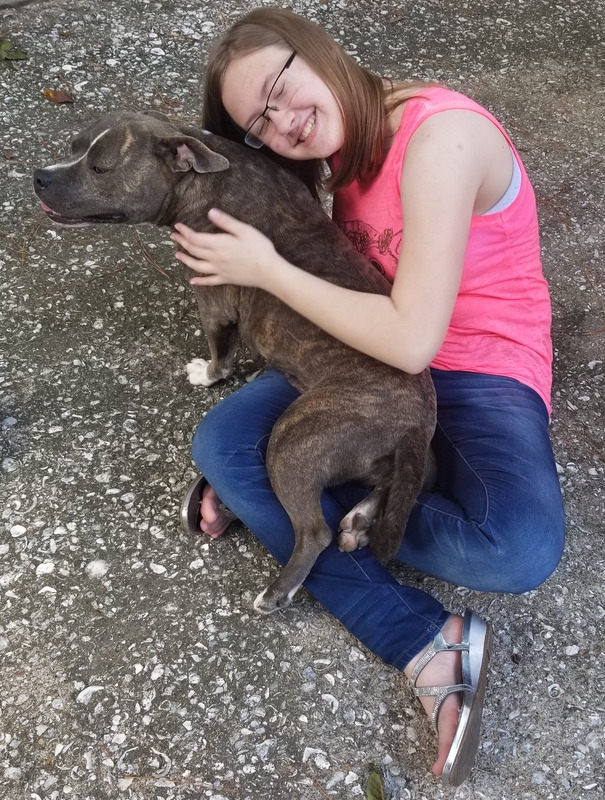 I called the Houston SPCA and they informed me they don’t pick up pit bulls. The day got hotter and the pups became lethargic. I began to worry they were overheated. At one point, while i was on faceboom live showing the puppies, I realized one had climbed under a car and was not moving. His labored breathing concerned me. Another was weak and tired and not moving too great either so I opened my laundry room door in hopes to give them some cool air to refresh. I lost my laundry room at that point but within 30 minutes of dragging the weakesr one in there, they began to look like they were coming alive again. Even momma seemed like she was feeling better. I contacted every shelter I was told about, scoured the web for rescues. But it was a Sunday…worse…the Sunday before 4th of July. I posted and shared videos, I called more shelters. Houston has hundreds of shelters and rescues. One, in particular has 800 animals. Another shared they are 3x over their limit. Most of the shelters here euthanize animals that may be hard to adopt (like pits) in order to make room for others coming in. Most strays get 3 days at the most before they are euthanized. Many rescues told me they were in dire need of foster families. My heart broke over and over to hear these stories. It became painfully clear they weren’t going anywhere for the night. We rigged some guinea pig fencing across the driveway because I was concerned they might run if there were fireworks. I was also concerned because momma was protective of her pups and our neighbors had reported other strays in the neighborhood. 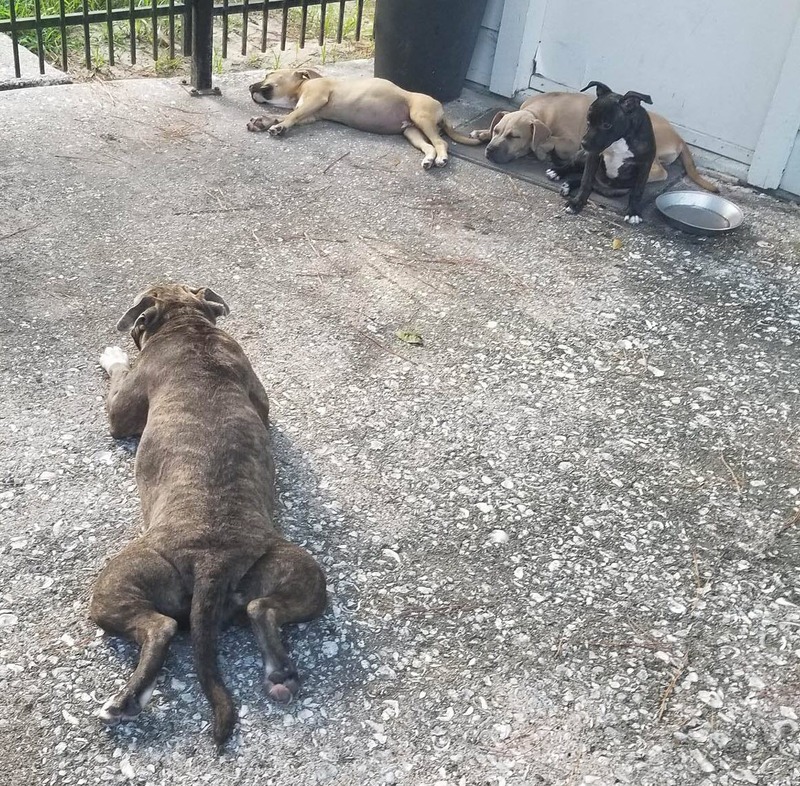 I sat outside with them in the heat, speaking softly and ensuring momma kept calm and they did not run out of food or water. I also didn’t want them to tear up anything but the puppies were too weak to care. When our dog (Mandy) would come out to go potty, they would watch her with sad eyes as if to say “We want to be on the other side of that fence too….” Only Momma wouldn’t let Mandy anywhere near the pups. I went to bed after spending almost the entire day with those dogs unsure they would stay the night. I knew the makeshift fence I had wouldn’t hold them if they chose to go. I also knew by this point that their chances were limited. I woke up this morning sunburnt and mosquito-bitten but knowing they would need sustenance and not wanting them to tear anything up as they became more awake, I ran downstairs. I took more pictures and posted more posts, sent more emails and went back to my desk to work. By 9 am, they were rambunctious and getting antsy. They needed more than I could give them. 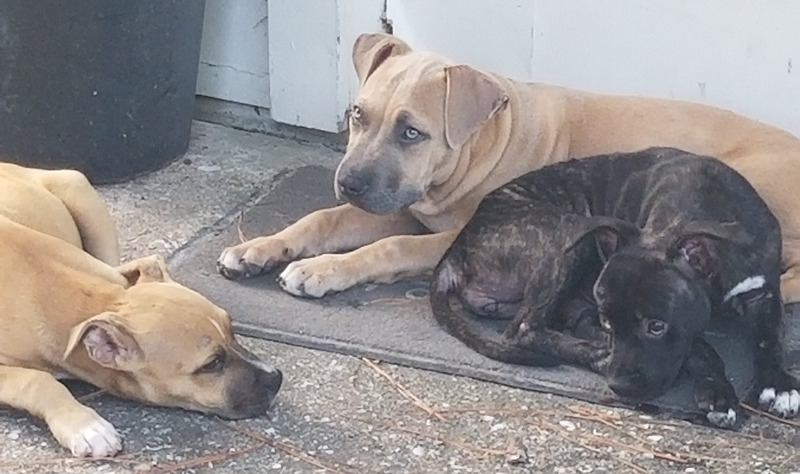 I called Animal Control to come pick them up in hopes they will find a home but I am so sad that I cannot more easily find their owners or a shelter. 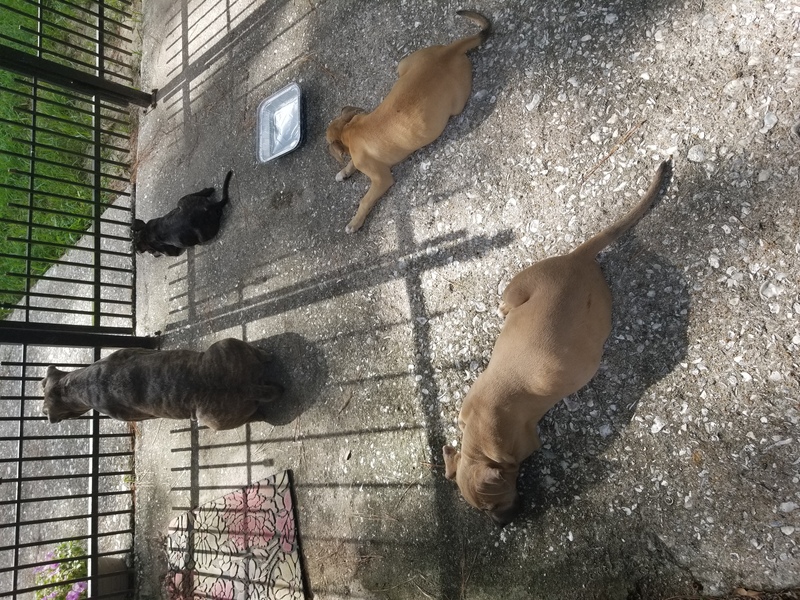 They all need flea baths and the pups look like they have worms … momma didn’t have a chip so no idea if her owners will find her but Animal Control was 100% positive that they were dumped. Each of them are so precious that my heart breaks that they may not ever find a family to love them and take them in. My heart especially broke for momma who loves her pups and keeps them safe. They’ve had a tough time of it and I wish that wasn’t so. So, this morning I’m praying for a miracle. 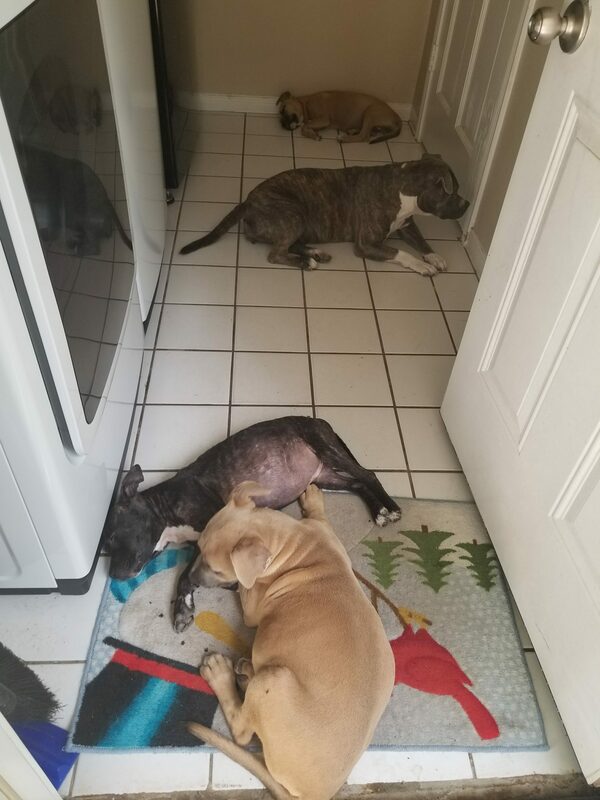 That someone will see these adorable dogs and adopt them or foster them..that they will get the help they need…that they will find true love in the form of a family. Will you join me? 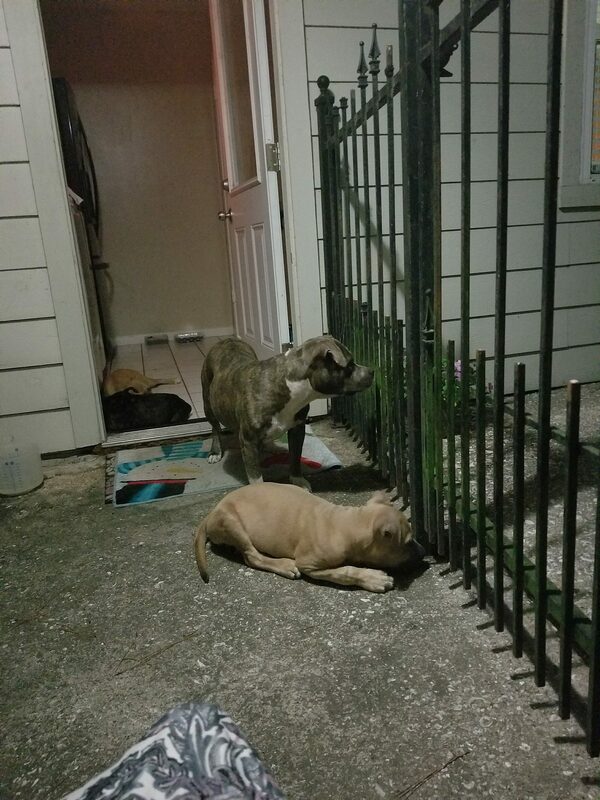 Update: The shelter says they are Mastiffs. Momma is less than 3 years old and the pups are rated as 13 weeks old. The owners may have been found. I look forward to hearing they are reunited and seeing each of them again in their home. 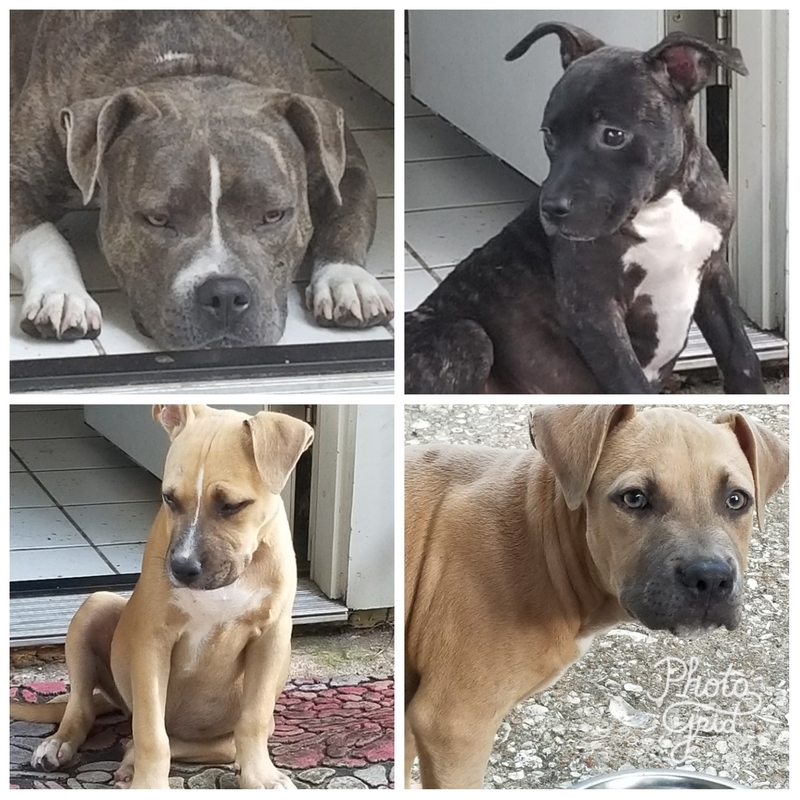 7/5/2017 update: shelter informed me that the owner called to claim them all. They expect him to be in today. 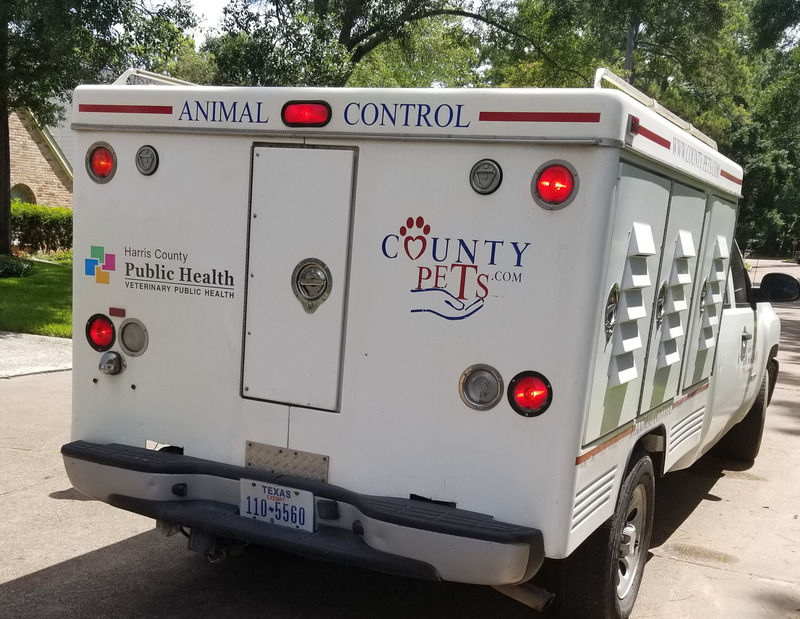 Impound fees are $40/pet and $10/day/pet with a requirement to get them all rabies shots and licensed within a certain period of time. If he picks them up today, that will be $280 at minimum. I feel for him. Had I had any inkling that these were his dogs and how to get ahold of him, I would have kept them at the house a little longer. P.s. They told me he claimed they are boxer mixes which I can kinda see when looking at pictures. I’m not a dog expert by any means so I really don’t know. Buy Choose Your Viking Now! Buy Renewing Your Viking Now!